I posted a video earlier this week, The Truth About College, which was created by an organization called the NIA (National Inflation Association). The following day, Wednesday May 18, they sent out an email recommending a stock called Mega Precious Metals (MGP). This weekend Peter Schiff, president of Euro Pacific Capital, sent out a video blog claiming this recommendation was a pump and dump. For those unfamiliar with the term pump and dump, it means that a small group recommends to a large audience that they purchase a stock that has very little volume and usually has very little worth. The new buyers push the low volume stock higher, and the insiders recommending the purchase then dump all their shares at a large profit. 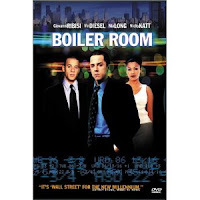 This was the story behind the movie "Boiler Room," and was commonplace during the late 1990's stock market bubble. I have not done any research on the company so I cannot say for certain that is the case with this stock. However, I have sent out multiple videos created by the NIA (I agree with their basic view of economics and I enjoy being able to provide a video format to discussions) so I wanted readers to be aware if they were to have signed up for any of their services. I also trust Peter Schiff. The yield on Greece 10 year government bonds hit a record 16.5% this morning, but the real news is the contagion that continues to spread through Europe. With the Greece, Ireland, and Portugal dominoes now toppled, the financial markets have shifted focus toward Spain and Italy. Protests groups have begun to mount in Spain as unemployment continues to trend above 20%, and the country begins to cut spending ahead of the coming debt crisis. Does this sound familiar? It is the exact scenario that played out in Greece, Ireland, and Portugal. 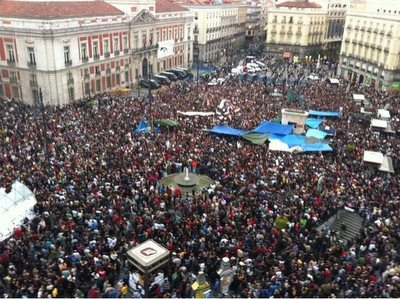 The following shows a recent rally in Spain, which has been a non-violent event so far. 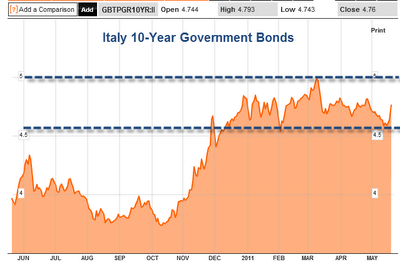 These protests, which are focused on not saving the banks during the bailouts, have moved to Italy as well. More and more people are beginning to understand that a bailout only ensures that banker bonuses remain at extremely high levels. The cost is then placed on the tax payer who faces both spending cuts and inflation. When they break higher from here, it will be crisis time. What happens after that is unknown. 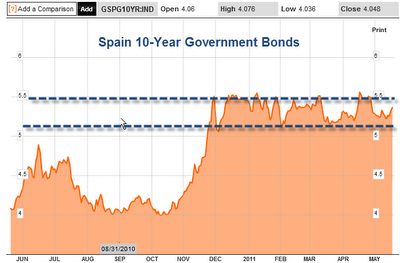 A Spain or Italy failure is the equivalent of Lehman brothers for the financial markets. The fireworks should begin before we reach 2012. I spent a lot of time here focused on the reckless spending policies put in place by president Obama. I think it is important to step back and remember that Obama inherited a terrible budget problem from George Bush. For those that were not readers of this site during the Bush administration I will note that I was just as critical of the terrible decisions being made during that term. 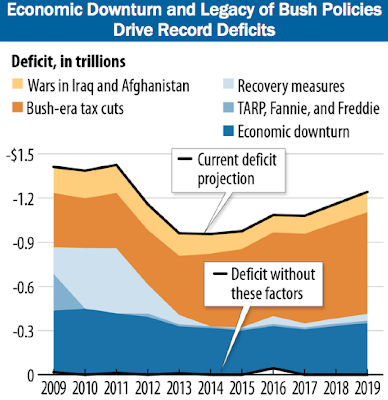 The following excellent graph shows where we would stand today without the spending programs put in place by Bush before Obama took office. The following video presents ideas from the Cato Institute to try and get ahead of the looming Medicare disaster. Ideas such as the one described here will continue to be brushed aside until we reach our debt crisis. Then those that today throw stones at Americans trying to cut out the government waste in Medicare will have the pleasure of enjoying Obama's death committee's. The members of team "hope we can believe in" that will determine who lives and who dies through rationing. The news this afternoon all across the media is regarding the US debt ceiling, which we are told will bring about "catastrophic" consequences if not immediately raised by our political leaders. Accounting gimmicks have pushed back the date needed to raise the ceiling to August 2nd. I would plan on the decision to raise moving to the 11th hour and an agreement to be reached after "concessions" are made where both parties can claim victory. 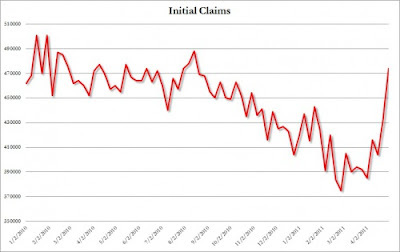 The real news yesterday, going unnoticed by Americans who were captivated by the debt ceiling charade, was the TIC data released by the treasury on who is (not) purchasing our debt. 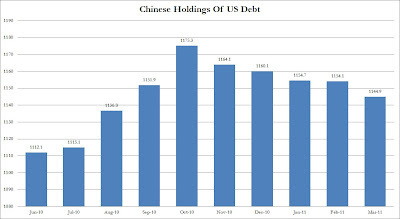 China's holdings of US debt continue to stream downward as they are quietly dumping our toxic paper into the market. Until now this has gone unnoticed during the Federal Reserve's QE2 program, but when that ends in June, and if the Chinese continue to move away from US debt, then the first look at the endgame will make an appearance. The financial world we find ourselves in today is eerily similar to the environment in late 2007 and the first half of 2008. Back in 2008, the United States had rates far lower than the rest of the world. This triggered money flows out of the US dollar and into higher paying interest rate emerging markets; Canada, Australia, Brazil, China. 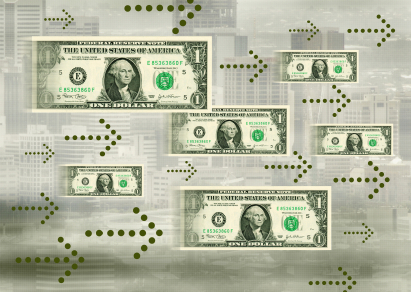 As money floods into these countries it pours into local stocks, bonds, and real estate and drives up inflation as the money enters their stream. 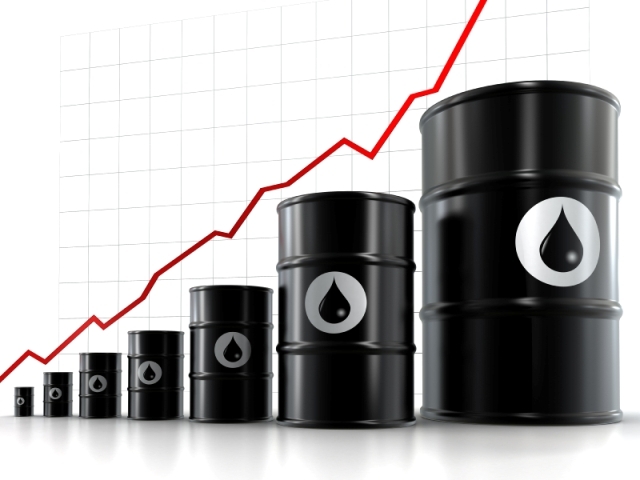 The United States imports most of the products we use and consume every day (about 75% of our oil is imported) and as the dollar moves lower it pushes the price of imported goods upward. As the imported raw materials prices rise for American companies producing goods, the impact is felt at the register for consumers. If costs continue to rise, as we see today, then it becomes far more difficult to continue to pass this cost on with increased prices. Companies must then look for ways to cut spending, and they begin with their highest cost and the easiest to remove: employment. This has created the resurgence of unemployment seen over the past month in the weekly claims. 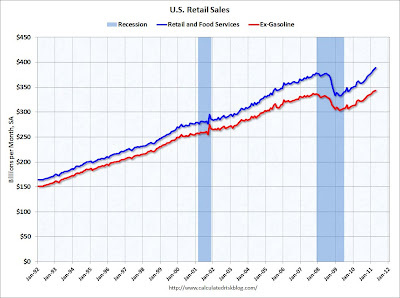 We are simultaneously seeing retail sales numbers rise, which confuses investors as unemployment rises. In order to understand they must see the total picture just discussed. 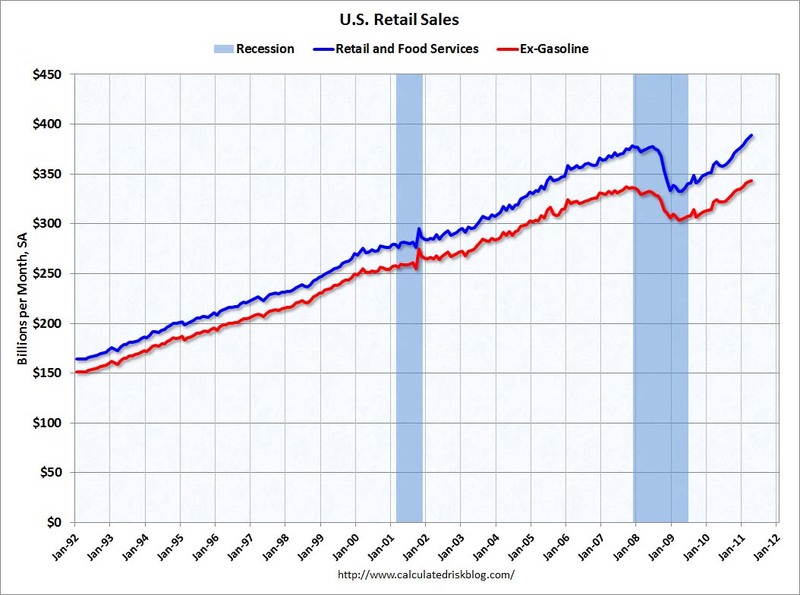 Total retail sales volume is rising, mainly due to the increased cost to produce goods, which is due in large part to the run up in oil prices. As the initial cost of imported goods continues to rise (Producer Price Index now increasing annually at 7%) and this feeds into the cost of consumer goods (Consumer Price Index now increasing annually at 5%) it will continue to slow down the economy. This is seen in the ECRI leading economic indicators, which are beginning to top and roll over. This is the mirror environment to 2008 and should keep the astute investor very defensive in their portfolio. While I recommended commodity related investments in foreign currencies, I have been cautious for 12 months now, continuing to recommend you hold your current positions but raise cash for a coming opportunity. I believe this opportunity is now close and should appear by year end. 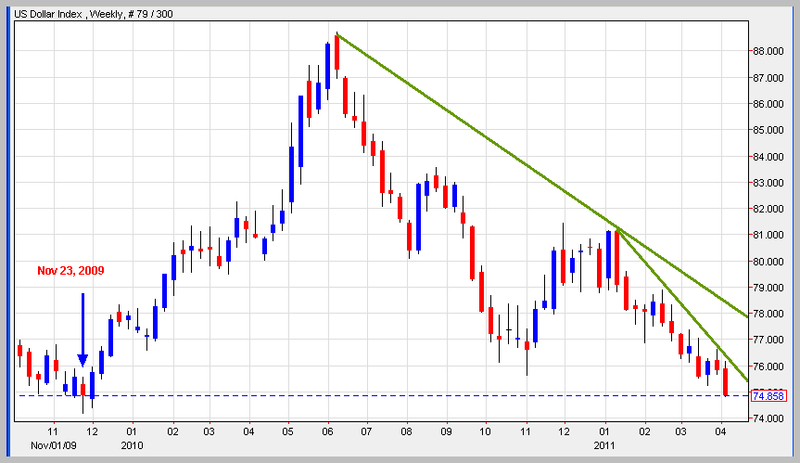 The dollar is beginning to strengthen, commodities have sold off, and stocks appear to be in trouble. If we get another sell-off during the second half of this year (A European debt crisis can trigger another deflationary drop; a topic I will continue to discuss) you need to have gunpowder dry and ready for when investors flee back into the perceived safety of treasuries and cash. At that point you can gladly hand them your cash in exchange for their strong assets that will be on sale. My guess is that Bernanke and Obama will not wait long if we have another slow down in the economy. 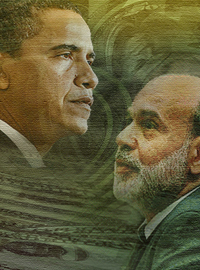 Bernanke will unleash QE3 and Obama will follow with a fiscal stimulus. This will then start the cycle over. I will continue to monitor both the monetary flows, as well as investor sentiment, to recommend the best time to deploy your cash that currently waits patiently. 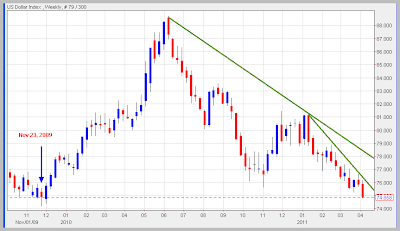 Until then, hope for commodity prices to continue to fall providing the gift of bargain pricing. The ultimate end game is a US currency that is far lower in value, and commodity prices that are higher than what we have seen during the current secular bull market. 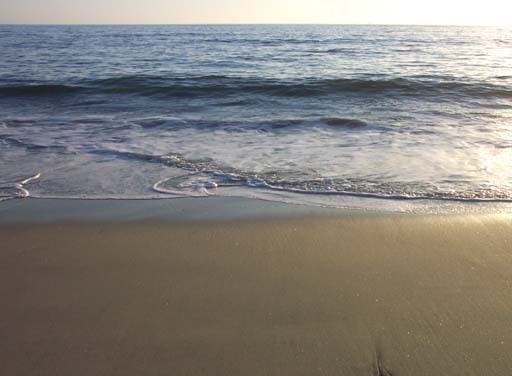 A secular bull market is similar to an ocean tide. It moves forward, then pulls back, moves forward, then pulls back, but it ultimately has a bigger picture movement that is unseen as you watch it unfold. 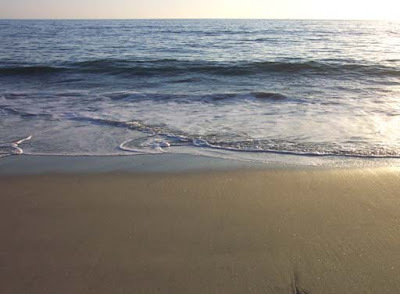 The tide is currently coming in for commodities and simultaneously moving out for stocks, but the entire process takes many years with continuous ebbs and flows. I am not a financial advisor, please speak with one before making any investment decisions.